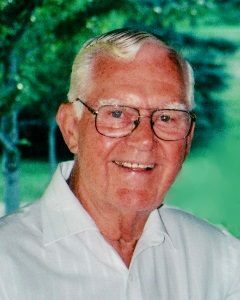 Harold Fritz, age 93, of Brownton, Minnesota, passed away Monday, January 28, 2019, at his home in Brownton, Minnesota. Private Family Memorial Service will be held with interment in Lakeview Cemetery in Minneapolis, Minnesota. Harold passed away peacefully in his sleep at home on January 28, 2019. He was born on April 4, 1925, to Robert and Bertha Fritz in Alexandria, Minnesota. He was an upbeat man with a very strong work ethic, and fun sense of humor. As a child, he had an unusual affliction. He would leave home and walk five miles to school in the cold with the wind always in his face up hill. His walk back home was six miles also up hill. As Harold would say the lay of the land was quite different back when he was a kid! Harold graduated high school in Alexandria, Minnesota, and went to serve his country proudly in the United States Navy during World War II. He was honorably discharged after the war ended. He returned to Minnesota to marry Delores Leona Flink. Together they had four boys, Kurt, Robert, David, and Carl. He worked for Burroughs Computers as a branch manager and retired after 37 years. During retirement he enjoyed travel and old time dancing with his loving companion of 28 years, Ruby Streich. He is survived by his sons, David (Kristin) of Mankato, MN and Carl (Colleen) of North Mankato, MN and grandchildren, Christopher, Bobby Jr, Amanda, Alexis, Nicholas, Michael and Annelyse. Harold was preceded in death by his wife, Delores; sons, Kurt of San Diego, CA and Robert of California City, CA and his brother, Norman of Rockford, IL. In lieu of flowers or gifts please donate in Harold’s name to the American Cancer Society or The Alzheimer’s Assoc. My deepest sympathy go out to the Fritz family, I feel privelaged and honored to have known Harold while growing up in Mankato, he will be greatly missed, and was a great man.